An in depth look at the recent increase in uncontrolled outdoor fires called wildfires around the world that have reached apocalyptic or biblical levels in recent times over the last few years or so. What's causing them, are they actually on the increase, is El Nino to blame, what can be done to control them if anything , or whether as with all the recent world events it's just business as usual around the world? for it's arrid climate and is also renowned for it's wildfires on an annual basis but again these seem to be higher in frequency and more ferocious in their intensity. But what are wildfires, where do they occur most frequently and what causes them, what are the biggest ones in history, how fast can they move and whether they are mentioned in the Bible in any shape or form? Wildfires are not that different from Tsunamis but instead of a wall of water you have a wall of fire out of control. Wildfires are uncontrolled blazes fuelled by weather, wind, and dry under brush. Wildfires can burn acres of land—and consume everything in their paths—in mere minutes. 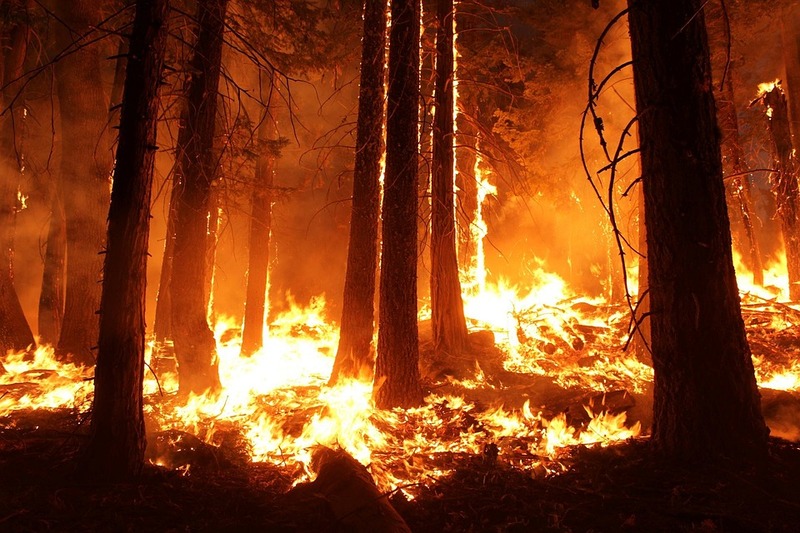 Depending on the type of vegetation that is burned, a wildfire can also be classified as a brush fire, bush fire, forest fire, desert fire, grass fire, hill fire, peat fire, vegetation fire, or veld fire. These forms of fire differ from other fires by their extensive size, the speed at which it can spread out from its original source, its potential to change direction unexpectedly, and its ability to jump gaps such as roads, rivers and fire breaks. That's what makes them so deadly. There are three conditions that should be available all together for an out of control fire to blaze, which fire fighters allude to as the flame triangle: fuel, oxygen, and a warmth source. Fuel is any combustible material encompassing a flame, including trees, grasses, brush, even homes. The more noteworthy a range's fuel stack, the more exceptional the flame. Air supplies the oxygen to a flame that needs to blaze. Heat sources start the out of control fire and convey fuel to temperatures sufficiently hot ignite. Lightning, smouldering open air fires or cigarettes, hot winds, and even the sun would all be able to give adequate warmth to start a wildfire. Where do most forest fires occur? 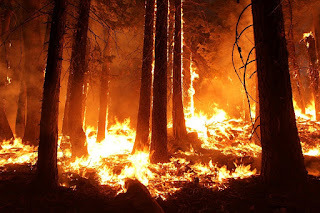 Out of control fires can happen any place, however are normal in the forested ranges of the United States and Canada. They are additionally occur in numerous spots far and wide, including a great part of the vegetated regions of Australia and also in the Western Cape of South Africa. In the US these rough infernos happen in a large portion of the 50 states, however they are most normal in the U.S. West, where warmth, dry spells, and continuous electrical storms make impeccable out of control fire conditions. Montana, Idaho, Wyoming, Washington, Colorado, Oregon, and California encounter a portion of the most exceedingly strong fires in the U.S. In California rapidly spreading fires are regularly aggravated by the hot, dry Santa Ana winds, which can convey a spark for miles. Bush fires in Australia are a typical event; on account of the by and large hot and dry atmosphere, they represent an extraordinary danger to life and buildings amid all seasons of the year, however for the most part all through the more scorching months of summer and spring. . Fossil records and mankind's history contain records of fierce blazes, as rapidly spreading fires can happen in intermittent periods. How fast can a wildfire move? A wildfire moves at speeds of up to 14 miles an hour (23 kms an hour), consuming everything—trees, brush, homes, even humans—in its path depending on environmental factors (such as wind strength and direction) and multiple other factors such as availability of fuel. Are they becoming more frequent and ferocious? On average, more than 100,000 wildfires, also called wild land fires or forest fires, clear 4 million to 5 million acres (1.6 million to 2 million hectares) of land in the U.S. every year. In recent years, wildfires have burned up to 9 million acres (3.6 million hectares) of land. So yes, there has been an increase which could be attributable to climate change such as El Nino or maybe some other external event. An interesting list of the most notable wildfires in History that were the largest and caused the most extensive damage. It may be noticed that half of that list have occurred in recent times from 2010 onwards. Peshtigo Fire 1871 most loss of life in a US wildfire. Landes Forest 1949 wildfire in South West France; 50,000 hectares (500 km2; 190 sq mi) of forest land were burnt - and 82 people killed. How are wildfires kept under control? Wildfires are at best difficult to control but their effects can be limited by firefighters. Firefighters battle rapidly spreading fires by denying them of one or a greater amount of the flame triangle basics. Customary techniques incorporate water drenching and showering fire retardants to quench existing flames. Clearing vegetation to make firebreaks keeps a flame from further fuel and can moderate or contain it. Firefighters likewise battle rapidly spreading fires by purposely beginning flames in a procedure called controlled smoldering. These endorsed fires evacuate undergrowth, brush, and ground litter from a woodland, denying a rapidly spreading fire of fuel. How to survive a wildfire? When you see smoke is it too late. Normally it is! Your first clue that there’s a forest fire nearby is falling ash, in that situation immediate evasive action may be required. There are many references to fire in the Bible but specifically in relation to wildfires and End Times, these three Bible quotes from the Book of Revelations are more relevant to the End Times scenario.